China's spaceship Shenzhou 7 has been successfully launched at 21:10 local time. President Hu Jin Tao expressed his congratulations. The spaceship is manned with a crew of three astronauts whose journey to space should last 100 hours. Its actual altitude at 18:51 CET is 262,5 km. The day before, Al-Jazeera already reported about the preparations of that mission that is intended to be the first step on China's way to the moon. It is reported that Chinese astronauts used to be treated with Chinese herbal medicine before and after their mission with Shenzhou 5 and Shenzhou 6. Such, it can be predicted that Shenzhou 7 astronauts have been treated equally to avoid one of them falling ill.
By the way, when it comes to name Chinese astronauts in the Western media, they are often called "taikonauts", an expression related to the word "tai kong yuan 太空员" that is used in the Chinese language for "astronaut". The vice-director of China's institute for rocket research, Lu Yu, in an interview with People's Daily online. Le Premier Ministre François Fillon a annoncé l'envoi de moyens supplémentaires (hélicoptères, drones, moyens d'écoute) à l'Afghanistan. Lors d'assentiment parlementaire sur le maintien des forces armées françaises il a aussi dénoncé "le mensonge et la désinformation", à propos du compte-rendu de l'OTAN. Les soldats ont toujours eu des munitions et ont pu communiquer, a affirmé F. Fillon. Selon J.L. Georgelin, le "compte-rendu" provient du "chef du détachement" des forces spéciales américaines. Le maintien des troupes a été opposé par la minorité de la Gauche. Des militants talibans présumés ont enlevé plus de 150 ouvriers afghans dans l'ouest de l'Afghanistan. Le consul général d'Afghanistan à Peshawar, dans le nord-ouest du Pakistan, a été enlevé par des inconnus. Ça c'est passé au même jour où l'hôtel Marriott à Islamabad, estimé comme un lieu de haute sécurité, a été détruit par une bombe camion. Entre les morts et blessés il y a eu beaucoup d'étrangers. CNN's Christiane Armanpour discussing foreign politics with former secretaries of state Henry Kissinger, James Baker, Madeleine Albright, Colin Powell and Warren Christopher. How would they advise the next U.S. president to decide. Life transmission from George Washington University / New York. - U.S. efforts to establish NATO membership with Ukraine and Geogia should be carried forward as it is up to Russia's neighbours to decide themselves. Russia should not have anything against it. - As to Iran's nuclear ambitions there's no need to vilify Ahmadi Nejad by getting too tough on Iran. Such kind of U.S. response could only lead to a strenghening of Ahmadi Nejad's position who is not the only person of importance in a very complicated Iranian society that is not yet fully understood by the West. - "I'm supporting Senator Obama." U.S. should take the lead in finding a global response to climate change. U.S. troops should be withdrawn from Iraq but not in a situation of political pressure. Says he is a close friend of John McCain. Nevertheless, he would not hesitate to advise McCain's opponent Obama to the best of his abilities as he, C. Powell, feels as an American in the first place which should count more than party politics; - citation: "We have to overcome this." Update for March 20, 2009, further down ! Financial turmoil rises as one of the greatest U.S. investment banks, Lehman Bros., finally collapses. As related companies are also filing for bankruptcy, a hitherto unknown drop of the Dow Jones Industrial index for more than 500 points (closing quotation at 10:00 PM CET) is the result. It is seen as the heaviest drop since September 9/11. The financial meltdown even affects European institutes like the British Barclays Bank and the German Commmerzbank (both lost more than 9% today), thus forcing the EU to intervene. Next bad news: U.S. insurance giant AIG also struggling. Insurance giant AIG is expected to be relieved by U.S. federal authorities in order to avoid diastrous ripple effects [CNN / Al-Jazeera]. * Parts of Lehman Bros. are now going to be taken over by the British institute Barclays Bank. * AIG shares continue to nosedive on Wednesday while an AIG bailout by U.S. federal authorities, who are now granting them an 85 billion $ loan for rescue, renews fears about the stability of financial markets. The word goes that AIG had already been teetering on the brink of bankruptcy for a certain time. * Russian trading halted as stocks plunge. Russian government orders 44 billion $ cash injection to the market. The Moscow market already suffered a loss of 57% since May 2008, mostly due to the Georgian military crisis. * CNN poses the question if we are witnessing the demise of capitalism. Experts reject that proposition and state that capitalism is working smoothly on a day-to-day basis, only hampered by certain "bubbles" created by political activities like those now emerging from the presidential election campaign. U.S. president directly addressed nation on wednesday. George Bush admits United States in the midst of a serious financial crisis. Bush warns of "long and painful" U.S. recession unless Congress backs 700 billion bailout. Bush invites Obama and McCain to the White House to discuss bailout bill. Obama and McCain issue joint statement promising to avoid economic catastrophe. Financial crisis now top concern for U.S. voters. A financial expert from Washington and who has a Republican background stated, the president's public action could turn out to be the worst action to be taken in that delicate situation. Nervous customers in Hong Kong have lined up outside banks for protest. Investors angry about failed investment linked to Lehman Bros. and call for better government control of financial markets. Experts point out that East-Asian markets already stabilized. Nancy Pelosi (Democrat), speaker of the House of Representatives, recognizes the need to insulate taxpayers and main street from the current economic crisis. Furthermore she states that U.S. taxpayers will no longer bail out the wrecklessness of Wall Street. "The party is over", she added. Barney Frank (chairman of the banking committee) says wreckless deregulation led us to the current financial crisis. First time in U.S. history we are curtailing the pay of company CEO's. Senator Dodd (Democrat) says we are having to grapple with an entirely avoidable problem. State owned regional bank institutes (Landesbanken) are suffering heavy losses from the crisis of U.S. financial markets. Three most prominent state owned institutes (BayernLB, LBBW and HSH Nordbank) are reported to have lost altogether 1,54 billion Euro including 1,4 billion Euro related to the bankruptcy of Lehman Bros.
Hypo Real Estate (HRE), Germany's No. 1 in the real estate business, received massive support from other institutes. An estimated sum of 10 billion Euro should have been provided. According to the Federal Bank of Germany, HRE can now be considered as saved from bankruptcy. Unexpectedly and despite its support by house leaders, the modified bailout bill has been rejected on Capitol Hill. As a reaction, the Dow index lost further 600 points. Only some hours after the first evaluation, stabilization of Hypo Real Estate seems to be related to a much higher sum than previously reported. Now, 35 billion Euro are being needed, probably including 26,6 billion Euro to be provided by German taxpayers. In the frame of latest news from Washington, the German Dax index lost another four percent. U.S. Senate approves bailout plan 74-25 at 3:30 a.m. CET. Plan will now be put to vote in the House of Representatives where some Democratic congressmen are still opposing it, even though Democratic majority leader Harry Reid and further high-ranking Democrats are trying to convince their colleagues. Presidential candidates McCain and Obama both support the bailout plan. Obama: "Bailout needed to avert catastrophe." Meanwhile the word "bailout plan" is often replaced by the expression "rescue plan for taxpayers" as homeowners' security is being brought into the foreground of the official debate. Washington soothed the markets when the House of Representatives finally passed the government's modified rescue bill but domestic unemployment is still high. The rescue plan for Hypo Real Estate, comprising 35 billion Euro, has failed. Further negotiations are needed [German National TV, Channel 1]. Yesterday's news forgotten. CNN telling that Hypo Real Estate has been finally saved by a 50 billion rescue bundle. Will such good news effect today's opening quotations in the EU ? World markets sent into freefall. Fears of a global recession. European shares see worst one-day percentage fall. Eurozone states vow to ensure financial stability. Joint national measures expected in Germany and other European states after the crisis summit in Paris. The French president Sarkozy stated that 27 European countries are decided to act in solidarity when it comes to avoid bankruptcy of any major financial group in Europe (source: BFM TV, Paris). The Dow Index closed below 10.000 for the first time in nearly four years, temporarily falling about 800 points within half an hour (Al-Jazeera / CNN). Further news: Local elections in Brazil while Brazilian stock quotes dropped an incredible 15%. The country's Worker's Party is expected to win (Al-Jazeera). Dow Index shows biggest gains since 1933 while Asian stocks are rising as well. The European Union is preparing a mega package for the stabilization of their institutes. U.S. economist Paul Krugman wins Nobel Prize. He is reported to be a critic of how the U.S. administration handled the actual crisis. What seemed to be a recovery of financial markets only ten days ago, now turns out to be the beginning of a steady loss of values on all international markets. Decreasing quotations in the percentage range and on a daily basis could even raise the question when "ground zero" will be reached. Now, a long-lasting damage to global economy can be predicted with only one single aspect to enjoy the indutrialized nations: Crude oil gets cheaper and cheaper (prices 30% down since beginning of 2008). October 29: Even though the DOW index is showing a moderate loss, in comparison with the day before, it is still closing on a high level. All U.S., European and East Asian markets had already been on the rise on October 28 while the oil price remains tied down. On November 13 it was officially announced that German economy has reached the state of recession. Meanwhile, fears are spread that Britain might follow Germany soon. Economists are warning that British economy is going to face its worst fate in 30 years. While Europe is said to be slipping into recession, G 20 members are gathering in Washington. The 20 states presented at that meeting are representing 85% of world economy and 75% of world population. The current voting power of the U.S., the European Union and China is shown below. Changes to the current voting power ratio are requested by China, India and Brazil, three nations with a flourishing economy. First results of the G-20 summit include a detailed 47 point program that has been fully accepted by the delegates. 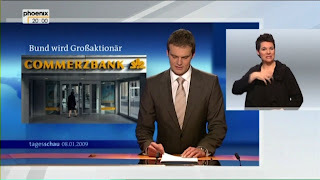 One of Germany's biggest institutes, the Commerzbank, has been partly nationalized. As the minister of economy, Mr. Glos, put it, the government's blocking minority should ensure the provision of industrial credits, intended to support sound middle-class companies in a period of stagnating economy. Further economic stagnation has been predicted for 2009 and should be comprising a decrease in exportation, first signs of which have already been noticed. In the frame of dropping share prices on all stock markets, after only a short period of recovery, the Commerzbank nationalization makes part of a bundle of measures, discussed within the ruling coalition and expected to increase domestic consumption. While U.S. car producers are hoping for financial support from their government, German carmakers are hoping for a reduction of the national car-taxes for buyers of their latest generation of cars. consequence, global economy is in "dire straits" and should grind to a halt in 2009 with a worldwide economy growth of only 0.5%, slowest rate since world war II. It should be mentioned that IMF's January predictions are less optimistic that its November 2008 evaluation. measures at a wrong moment. parts of Asia and Australia and, of course, in the U.S.A.
where unemployment hits a new record of 4.78 million. bonds to boost lending ability. After Obama`s 900 billion $ bill passing both houses on Capitol hill, immediate relief for U.S. economy is not yet in sight. General Motors and its German daughter Opel, now pledging for German government`s financial support, seem to be in an especially difficult position. Of course, German authorities, inclined to support Opel, are not willing to spend any money that could possibly flow back to General Motors, a company "known for decades for its bad management" as former financial secretary of state Blumenfeld put it, a respected expert with an own personal background in the car manufacturing industry. Instead, international stock markets are steadily going down. Especially the highly developed economic systems of Korea and Japan are affected. Korean national TV reported that Korea's economy is now the worst performer in Asia with an expected negative growth of 5% for 2009, and it will be very difficult for president Lee to stop further deterioration. As the recent economic crisis is a global and not a home-made one, it should not be ignored that South Korea's industrial potential is still on a high level: For instance, the production of thin film solar cells has got a boost in this country. Recent results of the Korean Institute of Energy Research have made it possible to participate a good deal on the market of solar cells, a market that is expected to reach a volume of about five billion $ by 2015. "Japan's export in January declined to less than half the volume of a year ago. We cannot predict how the economy is going to go in the next few months." This statement fits to the news reported in my blog earlier on January 14. At the same time, China is facing a tremendous drought that will doubless effect agricultural production, even though China's government is resorting to unusual means like inciting rain by shooting chemical-loaded rockets into the clouds. As to the British banking system, "historical losses" have been reported by RBS, the Royal Bank of Scotland (January 26). as a Stimulant for U.S. Economy ? On January 27, president Obama made it clear that the bulk of 142.000 U.S. troops in Iraq would leave the country by August 2010. Only 30.000-50.000 troops should remain as a transitional force till the end of 2011. This would actually mean the end of U.S. military involvement in Iraq, even though defense secretary Robert Gates could not fully exclude that a small task force might stay in Iraq even after 2011. Only two days before, Obama had already declared that "certain useless weapons related to the era of Cold War" would not be financed any longer. According to a Wallstreet broker, consulted by Al-Jazeera some days before, such declaration of their president could be useful to stimulate the markets in a situation of mistrust and confusion about the economic development to come. At the beginning of March 2009, the Dow Jones Industrial Index finally passed another gloomy mark on its constant way down. CNBC reported that Dow had not closed below 7.000 since April 21, 1997. Even though, this is regarded as "breaking news", it isn't any news at all because you could have waited for it. Let's remember that Dow once surpassed the 10.000 mark, only shortly before the beginning of the financial crisis. - The financial crisis finally took its toll among the richest people on earth: About 55 Russian billionaires recently dropped out of Forbes' list while Bill Gates (Microsoft) remains the richest man of our time.